FORMER IRISH JOCKEY Kieran Fallon has opened up about some of the dangerous weight-cutting techniques which are used in horse racing. Fallon, who retired last year at 51, was a champion jockey on no less than six occasions and won 16 British Classics including three wins apiece in the Epsom Derby and Oaks. He appeared on the Late Late Show on Friday night to promote his new autobiography ‘Form,’ where he discussed the measures that jockeys take in order to maintain a weight that enables them to ride. In Fallon’s case, he aimed to keep his weight at around eight and a half stone. “You’ve to make a certain weight, and if you don’t make that weight, you don’t ride. It’s a little like clocking into work,” he told presenter Ryan Tubridy. “It doesn’t happen very often, if you do that once or twice then your gone. Fallon however, stresses that this is not the same as suffering from the eating disorder bulimia. “You might have a cup of sweet tea just to rebuild your energy levels. Bulimic, I think, is where you think you’re fat, whereas this is where if you couldn’t make the weight, you didn’t have a job. You can watch the full interview on the RTÉ Player here. 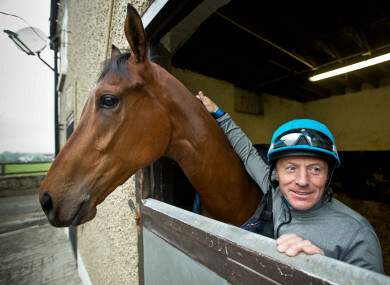 Email “'You could starve yourself:' Former champion jockey Fallon on dangerous weight-cuts in horse racing”. Feedback on “'You could starve yourself:' Former champion jockey Fallon on dangerous weight-cuts in horse racing”.